So you’ve decided resistance bands should be a part of your workout routine but are wondering where to start. As a beginner a major factor to consider is if you want to go with flat or tube resistance bands. Light resistance ratings suitable for the neophyte are available with tube style bands however there is one valid reason some may prefer to start with flat bands. It comes down to comfort. Flat bands don’t cause discomfort when pressed against your body like tube bands often can. The trade-off is that tube bands are stronger, last longer and are available in a much bigger variety of weight ratings. Additionally, when you get into bands offering high levels of resistance, there is no equivalent with flat bands. These factors aren’t marked disadvantages to people just starting out, so it can be said flat bands are more appealing to beginners. For more points about the differences between flat bands and tubes, you can read the post here. 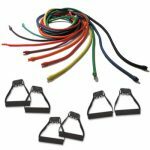 Now when choosing a resistance band kit the bigger question is, exactly how much of a beginner are you? If you’re already working out regularly, are fairly athletic and know your way around the gym, you could dive right in and get a popular set from Bodylastics. Even if you’re a recovering couch potato it wouldn’t be bad idea to get a standard resistance band kit that allows room for growth. The main reason being, it’s a better value to buy a set rather than individual bands. 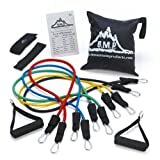 One of the top selling kits on Amazon from Black Mountain Products includes five bands: yellow (2-4 lbs. ), blue (4-6 lbs. ), green (10-12 lbs. ), black (15-20 lbs.) and Red (25-30 lbs.). This is a great set for beginners while having a lot to offer to intermediate people as well. It’s only bodybuilders, serious athletes and MMA practitioners that need the more pricey, extensive sets with super strong bands included. If you’ve decided to go with flat bands, the five band set from Fit Simplify is also a good choice. 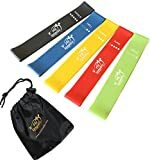 The bands are estimated to have weights as follows: green (x-Light) 2-4 lbs, blue (light) 6-8 lbs, yellow (medium) 10-12 lbs, red (heavy) 15 - 20 lbs, black (x-heavy) 25 - 30 lbs. Yet another route is to buy an individual tube band, plus a basic flat band set, and then do your own comparison before investing more. But really, with great tube sets selling under $30, there’s not a compelling need to do so.